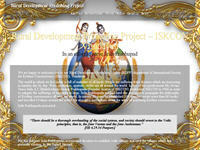 The official Website of Rural Development Preaching Project (RDPP), A Department of ISKCON Vrindavan. Its main objectives are to establish spiritual community based on agrarian life-style with special emphasis on cows, culture, education and devotion to the Supreme Lord Krishna. Category Farm Communities, ISKCON Outreach, Organizations July 2, 2012 by ISKCON Desire Tree.